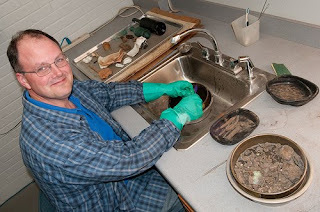 When I first started at MoDOT, I was surprised to hear someone say they’d spoken with “one of our archaeologists”. MoDOT is about highways and bridges, airports and barges, bikes, walkers, transit and the like. What was this nonsense about archeologists on staff? I soon learned that historical research is a vital part of receiving federal funding and permits for construction and building projects. Funds aren’t approved until MoDOT proves it complies with the National Historic Preservation Act. Tim Porter and Brianne Greenwood work in MoDOT’s Historic Preservation unit. You can think of them as cold-case detectives. They piece together the stories of people and activities from prehistoric times to near-current day periods. 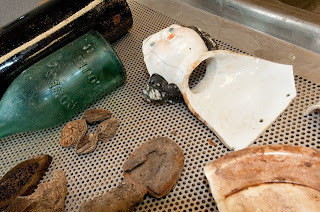 Last week, we found Tim processing artifacts excavated in St. Louis prior to the start of the earthwork for a new Interstate 70 Mississippi River bridge. The excavated areas were formerly residential, commercial and industrial in nature. Evidence of foundries, factories, homes and parks was uncovered. Some artifacts, like the bottle and china doll pictured here, were brought back to the office for further study. 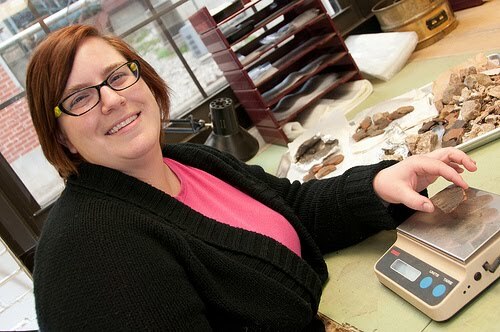 Brianne is helping to process artifacts recovered from two sites near the 80-year old North River Bridge west of Palmyra. The bridge, located on Route 168, is to be replaced this spring. Because it and the nearby archaeological sites are eligible for listing on the National Register of Historic Places, data must be collected before construction could start. Excavations at a site southeast of the old bridge believed to be dated 3000 to 1000 B.C. – known as the Late Archaic period – yielded evidence of people considered to be hunters and gatherers who did not raise crops. A more recent encampment site located north of Route 168 dated between 500 and 850 A.D. Here, evidence was found of groups of people living in structures much like wigwams, indicating they did not move around as much. Many thanks to Tana Akright for her contributions to this blog post.